I can't deny it. I'm not much of an outdoorsy person. Even when I used to mountain bike, I detested the splatters of mud and especially the whole body mud experience if I bit it. Hence, I do not have any interest in camping or getting in touch with nature. My idea of roughing it would be Motel 6. The horror! Yes, according to Choobee, I'm far too "tender". So when Viv suggested we go for a hike at Buntzen Lake, I did an excellent social fake with a crooked smile. Fine, if we were to do this, I was going to get food out of it. 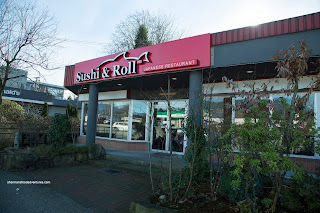 Hence, we stopped at the new location of Sushi & Roll prior to the hike. 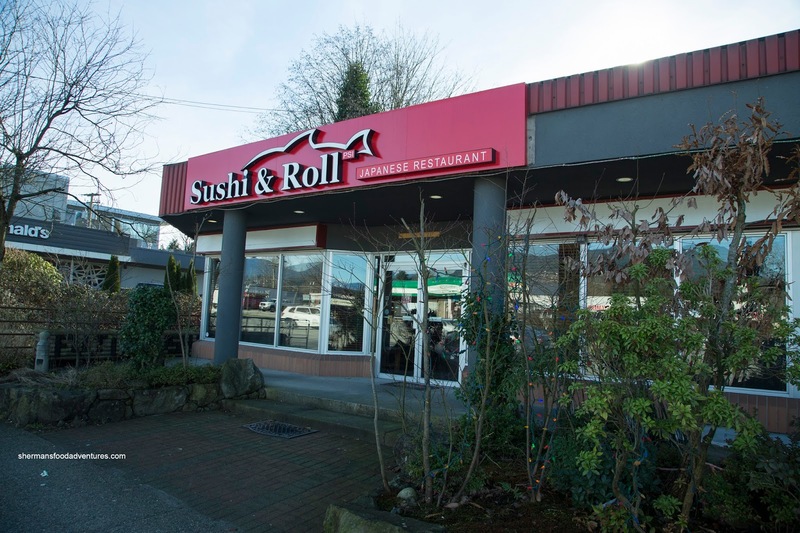 Taking over for the now closed Fuji Sushi, Sushi & Roll offers up an experience not unlike Sushi Garden, Sushi Town, Sushi California and the sort (tempered expectations as a result). 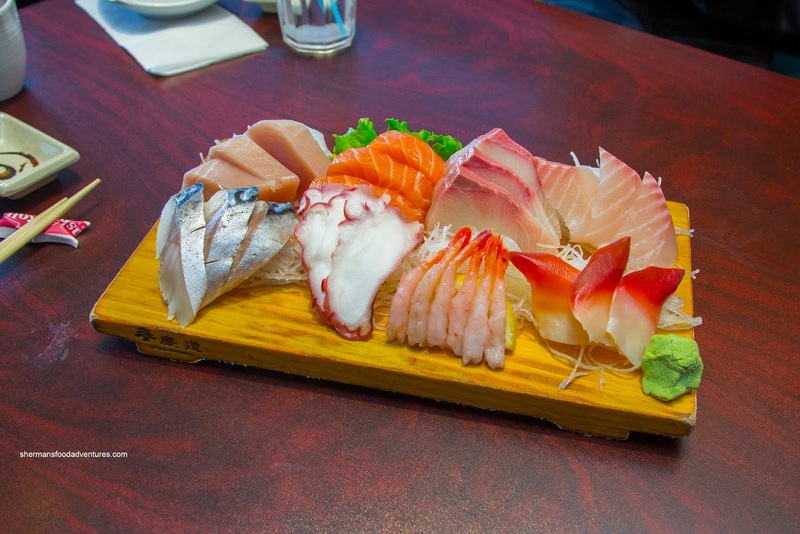 We kicked things off with the Deluxe Assorted Sashimi. By looking at the picture, everything appeared okay and in some sense, quite good. But that is where the "good value" sushi thing kicks in. For example, the hamachi exhibited a fresh sheen and smell. Yet, rather than being buttery, it was firm and a bit bland. So with reasonable expectations, the sashimi was decent. 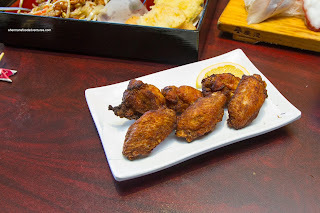 Next, the Chicken Karaage looked like it had been to the Caribbean due to its tanned appearance. Overlooking that, the skin was rendered and crispy while the meat underneath was juicy and well-seasoned. 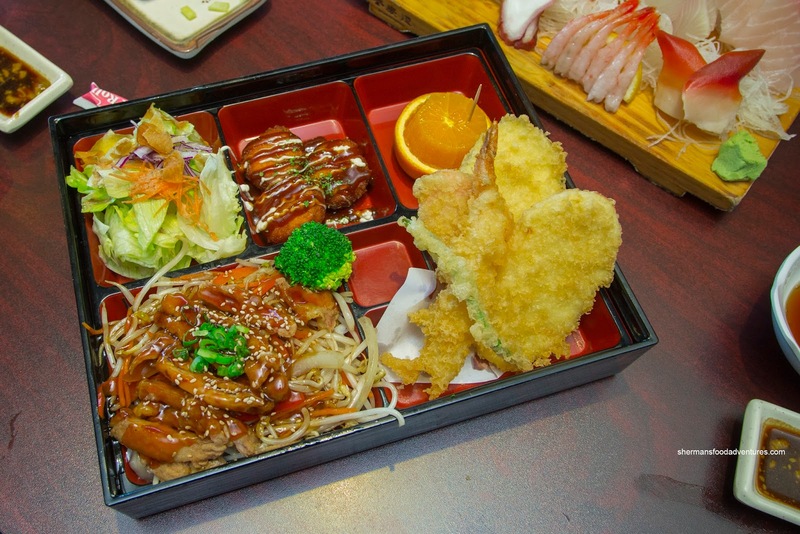 Onto a Bento Box A that included green salad, Chicken Teriyaki, Tempura and Crab Cakes, we found that the crab cakes were actually fried imitation crab (not very good either). As for the chicken teriyaki, it was okay where the meat was relatively tender. Although the tempura was slightly over-battered, it was still crispy. However, these was a bit more oil retention as a result. For our first roll of 3, we got the House Roll which was pretty much stuffed with the usual ingredients. We liked how the layer of rice was thin, but at the same time thought it was slightly dry. The roll was packed tightly enough that generally held together until we bit into it. Just because I love the Filet-o-Fish, I decided to order the roll with the same name (isn't that copyrighted or something, funny how McD's is just next door). Well, this wasn't anything like the burger as there was far too much rice. It hid the small piece of fried fish. On the other hand, the dressing was nicely tart while being only conservatively applied. 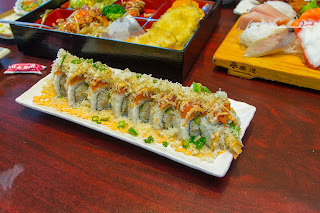 For our specialty roll, we got the Fantastic Roll comprised of shrimp tempura, imitation crab, cucumber, avocado and mayo with spicy tuna and tempura bits on top. 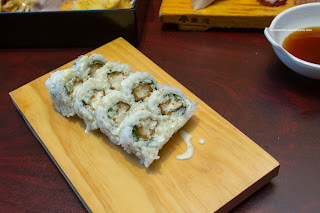 Interestingly, even with all of the wet ingredients, the roll ate a bit dry. This might possibly had something to do with the rice. 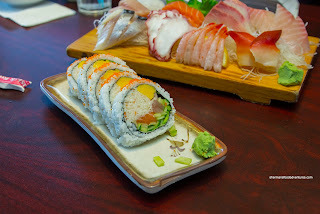 In terms of taste, it was mildly spicy where I still needed some soy and wasabi to liven things up. Overall, the meal was okay given our expectations. Definitely serviceable for those who aren't overly picky.